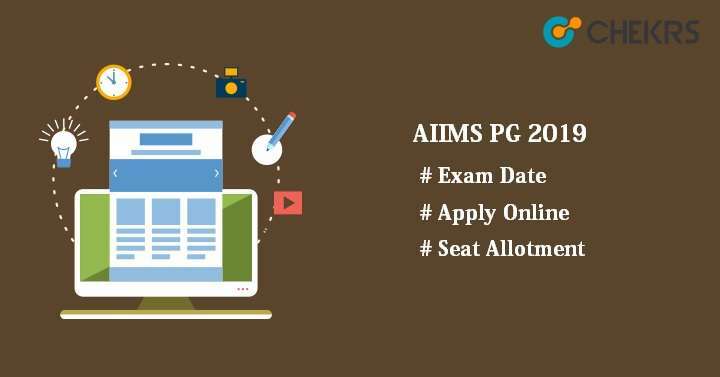 AIIMS PG 2019: All India Institute of Medical Sciences Post-graduate (AIIMS PG) is a national level Medical Entrance Examination conducted by AIIMS, New Delhi. Candidates who wish to take admission in AIIMS or its affiliated medical colleges for the postgraduate medical courses can apply for this exam. Latest Update: AIIMS PG 2019 Code Generation for Final Registration (6-year courses) will start from 8th March 2019. Latest Update: AIIMS PG 2019 Result for January session has been released. Check the Procedure below. Latest Update: AIIMS PG 2019 Basic Registration for July 2019 session (6 years courses) has been started. This exam is held twice in a year. In January month, it is conducted for first time and the second time in July. To get admission to PG courses like MD/ MS/ MDS/ DM/ M.Ch, all interested candidates have to apply online for AIIMS PG Application Form. Here we are providing all the information like AIIMS PG exam date, result, eligibility, syllabus etc. Candidates are suggested to read the AIIMS PG Eligibility Criteria carefully before filling the AIIMS PG online application form. Candidates should have MBBS degree for MD/MS recognized by MCI (Medical Council of India). For MDS, BDS degree is compulsory. General Candidates must have scored minimum 55% aggregate in marks. For SC/STstudents, 50% aggregate is required. Candidates will have to complete 12 months of training or internship on or before 30 July 2019. Only Indian citizen can apply for AIIMS PG 2019. Applicants must have degree in MD/MS or DNB from university recognized by MCI. Candidate’s maximum age should be 35 years as on 1 July 2019. There will be reservation for OBC/SC/ST candidates. SC/ST- 5 year reservation and OBC- 3 year. Follow the given link www.mdmsmch.aiimsexams.org. Click on ‘New Registration’ for new user. Already registered user can enter the details in applicant login and then click on ‘Login’ button. Fill the application form with all required details like personal, contact & qualification details. Upload the scanned photograph, signature & thumb impression according to the size and format prescribed by AIIMS. Pay the fee through online any of modes Debit Card/ Credit Card or Net Banking. AIIMS PG Examination Fee will be different for different category. For General/OBC candidates, it will be Rs.1500/- and for SC/ST, fee will be Rs.1200/- including transaction charges. Is there any facility to modify my choices of City/Centre of Examination after completion of last date? No, the city/centre of examination once chosen and allotted will not be changed. Candidates will be required to join the course within stipulated time as mentioned in the Prospectus. How many times can I appear for AIIMs examination? There is no limit for the number of attempts for AIIMS examination. Do I have to indicate choice of AIIMS Institutions during application filling? The question paper will be asked in only English medium. 1 mark will be allotted for each correct answer. – 1/3 marks will be reduced for each wrong response. For MD/MS, total 200 questions will be there and time duration will be 180 minutes. For MDS/DM/M.Ch./MD (Hospital Administration), 90 will be asked and time to complete the paper will be 90 minutes. The question paper level will be of MBBS for MD/MS and for MDS, questions will be comes from the syllabus of BDS course. The examination will be held through computer-based test (online). Multiple Choice Questions will be asked in the examination and for each question 4 options will be there. AIIMS PG Entrance Exam Syllabus will be same as the syllabus of MBBS & BDS course like Clinical, Pre-Clinical and Para-Clinical. AIIMS PG 2019 Syllabus will be prescribed by AIIMS, New Delhi. In order to make better efforts, candidates should be prepared for the exam according to the course. By practicing the AIIMS Medical PG Sample Paper, candidates can improve their speed and accuracy. Previous year paper gives the idea of questions asked in the exam, marking schemas, topic-wise weightage etc. Take a short break between continuous studies. Make key points of important topics. Try to solve more and more sample paper. AIIMS, New Delhi will issue the AIIMS PG Exam 2019 Admit Card on its official site. Candidates who submitted their form successfully can download it through online mode. Visit the official website of AIIMS PG. Enter Candidate’s Id, Password & Captcha. Click on ‘Login’ button to submit the entered details. Take the print of it for future references. Go to the Important Notices and click over it. Notification panel will open with the date of uploading. Search for the Rank wise/ Roll no wise RESULT OF AIIMS-PG ENTRANCE EXAMINATION FOR JULY-2018 SESSION. Click on View or Download. Result will appear in the pdf format on your screen. Search your roll no and see your overall rank, category rank and percentile. AIIMS PG Cutoff will be released along with the results. It will be the minimum required percentile to qualify the AIIMS PG entrance examination. AIIMS Exam Cutoff changes every year. Cutoff will be set by AIIMS, New Delhi. Candidates, whose name will be in the rank list, will be able to attend the AIIMS Online PG Counselling. Seat will allotted to candidates on the basis of their performance in the entrance examination. It will be started after the result declaration. Seat Allotment will be organized through online mode only.